The Talking Transport podcast at Traffex and Parkex is your trusted audio guide to some of the must-see-and-do things going on at the event. SMART Highways editor and Head of Content for Traffex Paul Hutton presents the programmes which are available on the Traffex App and website and on SMART Highways. In Tuesday’s programme sponsored by SWARCO, Paul talks to Richard Neumann from the Austrian company about its 50th birthday celebrations and how it really does have something to show all visitors, whether they are traditional road builders, transport technologists or parking experts. Paul Wilson of show partners Kier explains how safety runs through everything his company does and some of the innovative work they are doing to assist with mental health. 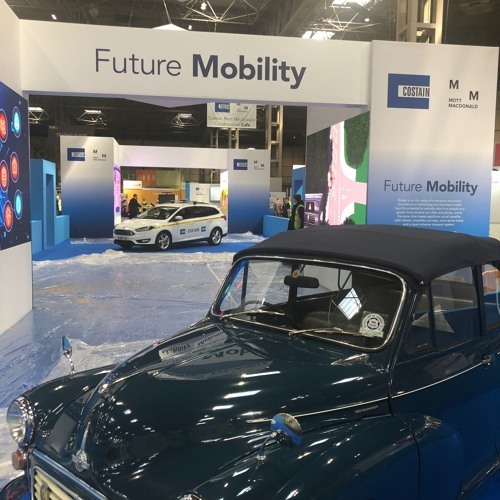 We hear from event director Adrian Tatum about the what’s on the programme, take a tour of the Future Mobility zone (pictured), chat Parkex and to one of Traffex’s regular exhibitors, Clearview Intelligence. It’s well worth half an hour of your time to have a listen!